AUGUST 1. 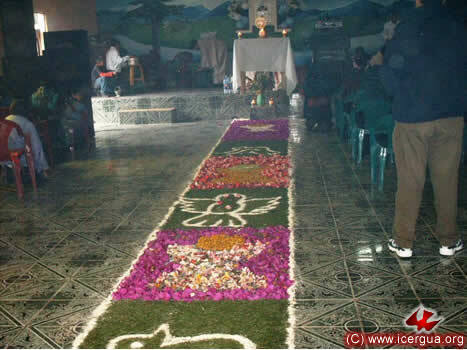 EUCHARIST IN JOLOMCÚ, SAN RAFAEL LA INDEPENDENCIA, HUEHUETENANGO. Our bishop was invited to preside at the Sunday Eucharist on August 1 in the Jolomcú Community, San Rafael La Independencia. Father Luís Felipe Corimanya, responsible for the pastoral work of the Parish of Los Santos Arcángeles, concelebrated. It was a good opportunity to meet the brothers and sisters there and confirm their enthusiasm and see firsthand their efforts to get in position to build a permanent parish church soon. AUGUST 1. 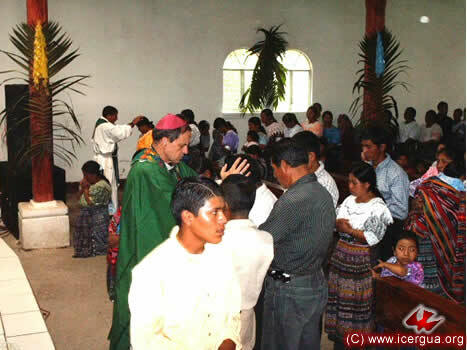 BLESSING THE PASTORAL RESIDENCE IN SAN PEDRO SOLOMA, HUEHUETENANGO. On the day when the pastoral residence in San Pedro Soloma was to be blessed, the bishop was invited to preside at the Eucharistic celebration and then proceed to the blessing of the house. The house consists of two rooms and facilities to accommodate two presbyters, as well as the other amenities that are necessary for a residence. 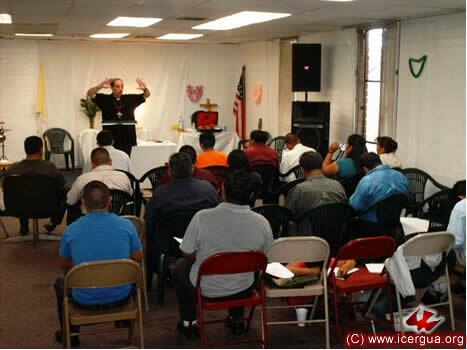 In addition it has a small room for meetings that will serve as a parish hall. This work constitutes the first part of a much larger project that will involve the construction of a beautiful parish church. Above: The celebration of the Eucharist. The community continues to grow by leaps and bounds. Each week new members are joining. Left: The bishop and Father Luís Felipe preparing to bless the pastoral residence. Right: Lunch that was offered by the Pastoral Council after the blessing of the pastoral residence. It was held in the dining hall of the new house. AUGUST 6. DEANERY OF CENTRAL QUICHÉ 1 (CUNÉN-SACAPULAS). On Friday, August 6, the Deanery of Central Quiché 1 took place in the meeting hall of the community of Central Cunén. 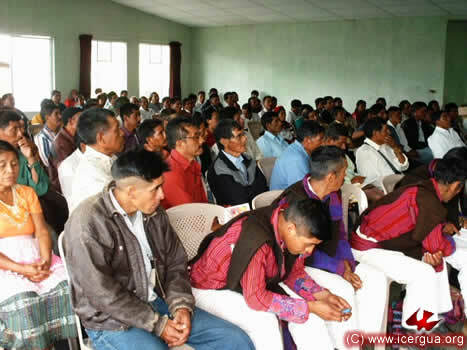 Representatives of all the communities of Cunén and Sacapulas attended. Above: The Deanery in session. Right: The large lot owned by the Cunén Church. 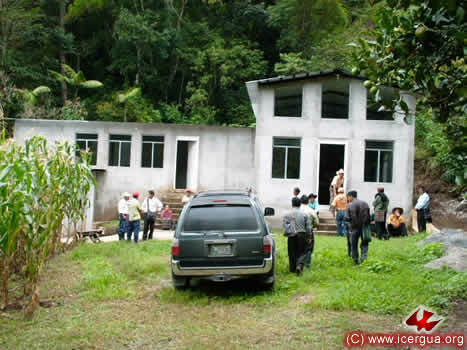 Just now the construction of a small mission center is being completed, which will serve temporarily as a residence for the presbyters who work in the area. AUGUST 6: CELEBRATION IN MEDIA LUNA, CUNÉN, QUICHÉ. 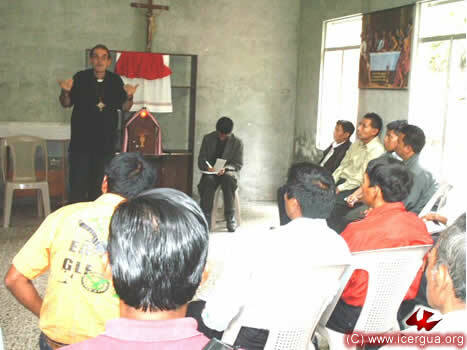 During the afternoon of the sixth, Monsignor Eduardo visited the Media Luna community in Cunén. Baptisms and the Eucharist were celebrated. 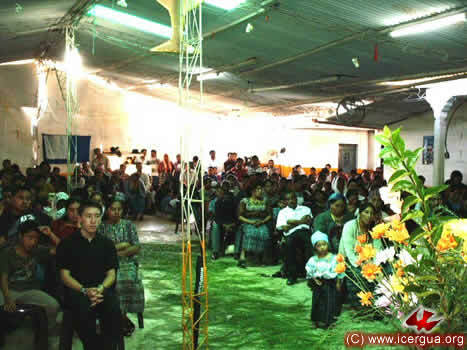 The community has completed the construction of its church. It is a modest, but large building that expresses the faith and dedication of the faithful in the community. Above: Monsignor Eduardo giving Absolution to some of the faithful who had previously made the confession of their sins. Right: The celebration of baptism. AUGUST 6: VISIT TO THE SACAPULAS COMMUNITIES IN PARAXTUT, SACAPULAS, EL QUICHÉ. During the evening of August 6, our bishop visited the Paraxtut Community in Sacapulas. This community has continued to experience significant growth recently. Although it has not yet built a house of prayer, it has dedicated an entire residential building as a provisional church and there, with the presence of the Most Holy Sacrament, they dedicate themselves in prayer and continue to deepen their faith and Christian commitment. Above: The Paraxtut Community in deep prayer. Right: Monsignor Eduardo giving Absolution to the faithful who have confessed their sins. AUGUST 7. DEANERY OF CENTRAL QUICHÉ 2 (USPANTÁN). 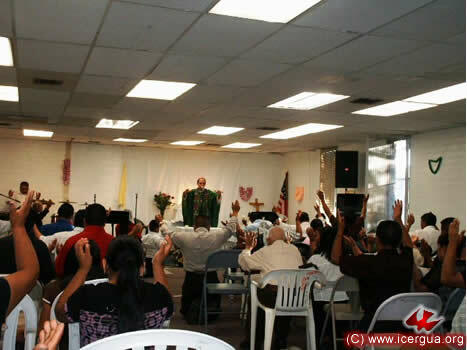 On the morning of August 7, the Deanery of Central Quiché 2 took place in the Charismatic Center of Uspantán. About fifty faithful attended, representatives of all the communities. 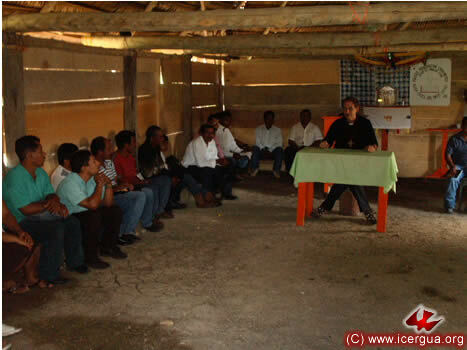 The central topic of the meeting, in addition to the formative instruction given by the bishop, was to share the experiences of rapid growth that the communities are experiencing, especially since the twenty-first of June when they acquired the parish center in Tierra Blanc Jacubí. 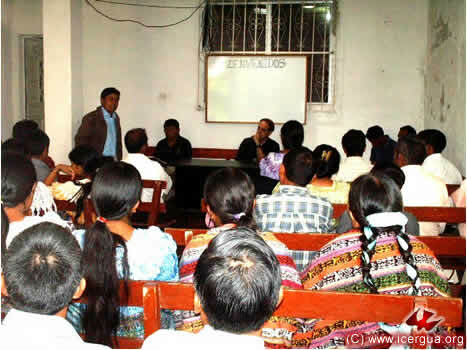 Above: One of the community representatives reporting the activities of his community. Right: Father Bernabé, in charge of pastoral work in the parish, reporting on the activities of the past quarter and making an evaluation of the steps that have been taken. At the end of the instruction segment, given by the bishop, the faithful were consulted to see it they approved various resolutions respecting the future of the Church and ecumenical dialogues that we have been undertaken. Left: The people voting. AUGUST 7. 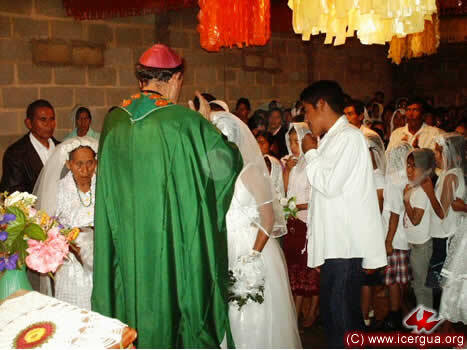 ANNIVERSARY OF THE SANTÍSIMA TRINIDAD PARISH, USPANTÁN, EL QUICHÉ. On the afternoon of the seventh, with the participation of representatives of the various communities, Monsignor Eduardo presided at the Eucharist, giving thanks for the completion of the first year since the creation of the Parish of Santísima Trinidad of Uspantán. The faithful are very happy on account of the experience that they are having and feel very excited in going forward on the path of evangelism. AUGUST 7. 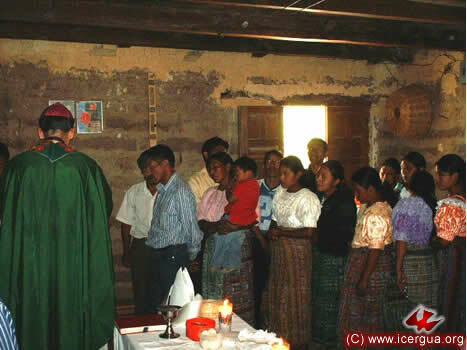 MASS WITH THE CHOLÁ COMMUNITY, USPANTÁN, EL QUICHÉ. 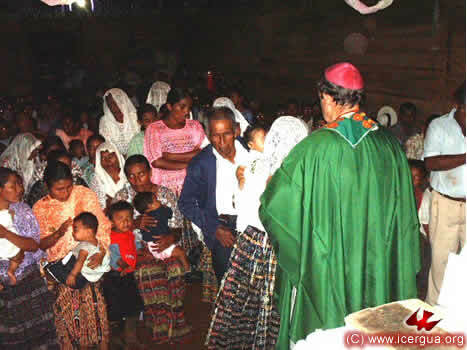 In late afternoon on the seventh, Monsignor visited the faithful of the Cholá Community in Uspantán. The brothers and sisters are suffering fierce persecution, but are still eager to continue struggling to be true to their faith. AUGUST 8. VISIT TO THE SAN LUCAS COMMUNITY, USPANTÁN, EL QUICHÉ. On Sunday morning. 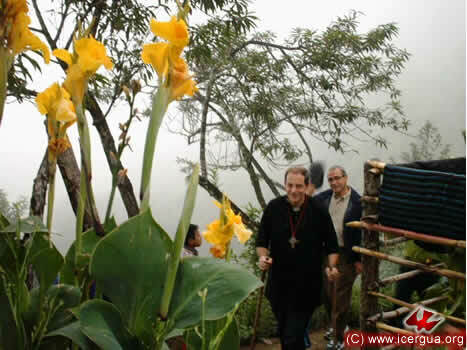 August 8, the Monsignor visited the little community of San Lucas, located a few kilometers from the center of Uspantán. This small community is excited and ready to work intensely to give witness to the Gospel to all their brothers and sisters. AUGUST 8. 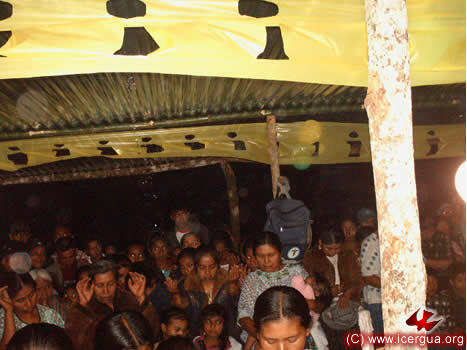 EUCHARIST IN THE CENTRAL CUNÉN COMMUNITY, EL QUICHÉ. 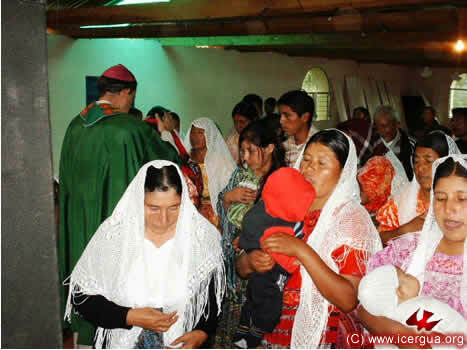 On the afternoon of August 8, the bishop presided at the Eucharist with the Central Cunén Community. Several baptisms were celebrated, and the bishop had a meeting with the directorial committee of the community. AUGUST 14-15. VISIT TO THE LOS ANGELES, CALIFORNIA, MISSION. 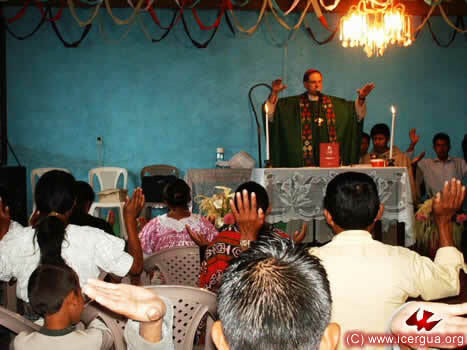 On the fourteenth and fifteenth of August, Monsignor Eduardo visited the Parish of San Miguel Arcángel, and celebrated in two of the three communities that form the parish. 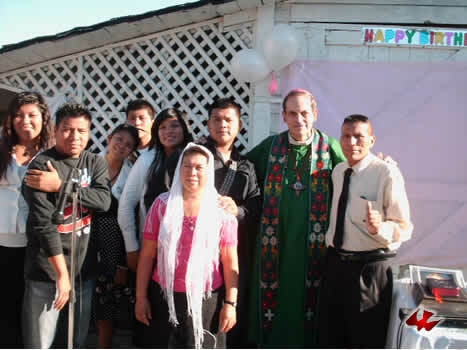 Left: At the end of the first Mass, the bishop is posing with the family of Brother Rogelio, who had asked that the Mass be celebrated as a thanksgiving for his daughter, because it was her birthday. During the afternoon, the Monsignor presided at the Eucharist with the El Pescador Community, where the Parish has its center. It is always a blessing to celebrate in this community because the joy and commitment of the People of God make one feel the presence of the attributes that characterized the first Christian communities. Above: The bishop invoking the outpouring of the Holy Spirit on the Assembly so that the forgiveness of sins might be granted to those who have confessed. Left: Prayer during the celebration. On Sunday the fifteenth, the fifth meeting of ESTYMLA took place for the students in the Continuing Education program. This session finished what corresponds to the end of the first semester. On the next visit, in September, two new courses will begin: “Study of the Pauline Letters” and “Liturgy.” By means of this instruction the faithful are growing in ecclesiastical awareness and in their commitment. The Los Angeles visit culminated at midday with the celebration of Eucharist for the students in the Continuing Education program. Left: Brothers Matías and León presenting the offerings. AUGUST 20. 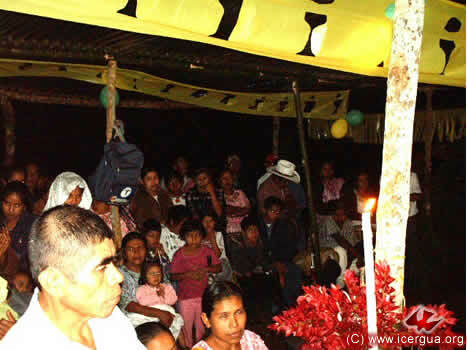 ANNIVERSARY OF THE PAJOMEL COMMUNITY, SANTA CRUZ LA LAGUNA, SOLOLÁ. 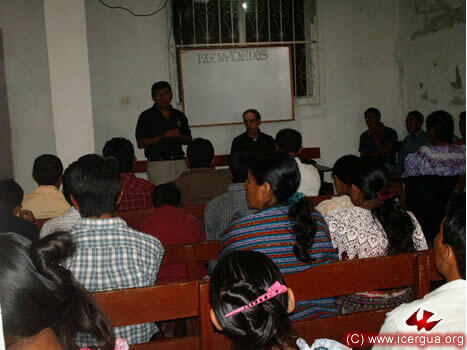 On Friday, August 20, Monsignor Eduardo visited the Pajomel Community in the municipality of Santa Cruz La Laguna, Sololá. 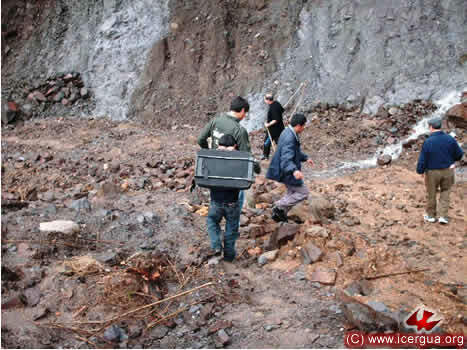 The excessive rains had obstructed the highway so that access to the community at present is possible only on foot. At left: The bishop on his way to the community, accompanied by Deacon Pedro and Seminarian Orlando, who are both teachers in ESTYMLA, and by Brother Segundo, who was visiting us from Peru. 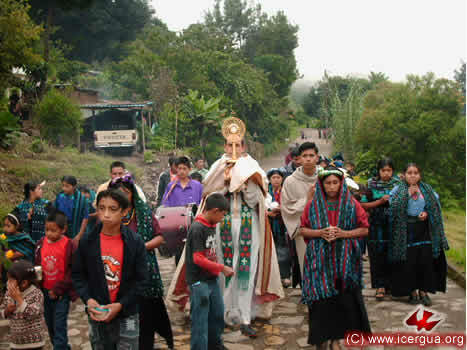 The occasion of the bishop’s visit to Pajomel was the celebration of the fourth anniversary of the arrival of the Most Holy Sacrament to the community, which coincides with the anniversary of the date when the church made its covenant with ICERGUA. For that reason and in spite of the rain the faithful had decided to begin the celebration with a procession of the Sacrament from the entrance to the village to the church, to be followed by the Eucharistic celebration. Above: The Most Holy Sacrament is uncovered and the Adoration begins at the entrance to the village. Left: The procession, heading toward the church. Right: The very beautiful carpet that the faithful made for the procession of the Most Holy Sacrament on entering the church. AUGUST 20. VISIT TO THE CHUITZANCHAJ COMMUNITY, SANTA CRUZ LA LAGUNA, SOLOLÁ. 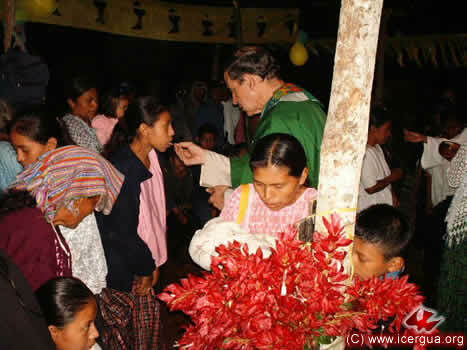 In late afternoon of the twentieth, our bishop made a visit to the Chuitzanchaj Community, Santa Cruz La Laguna, Sololá. Two children received the sacrament of Baptism. Above: Prayer during the celebration. Left: The whole assembly extending hands and praying for the outpouring of the Holy Spirit upon the children that are to be baptized. AUGUST 20. VISIT OF SEGUNDO GALARRETA FROM THE PERU MISSION. 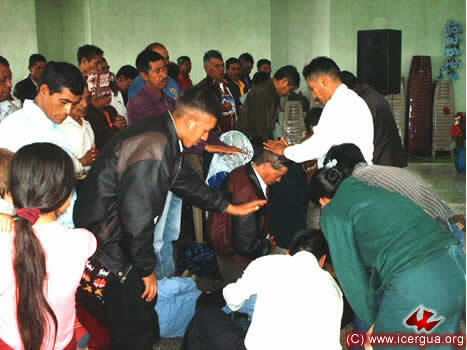 From the twentieth to the thirtieth of August, we were blessed with the visit of Brother Segundo Galarreta to Guatemala. Coming from Peru and a member of the Church there, he came to see firsthand what we are experiencing, with the goal of implementing something similar there. 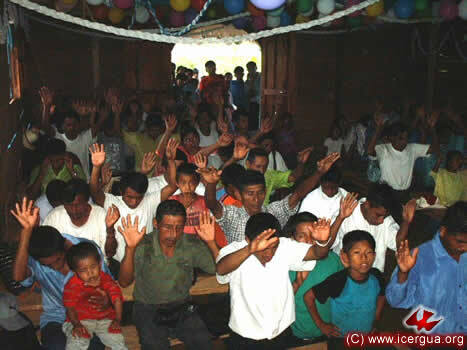 He was happily surprised to see the active participation and deep commitment of the faithful. His commitment was to return to Peru and work to the end that the identity and charisma of our Church in Guatemala may be fully incorporated into the Peru Mission. AUGUST 21. 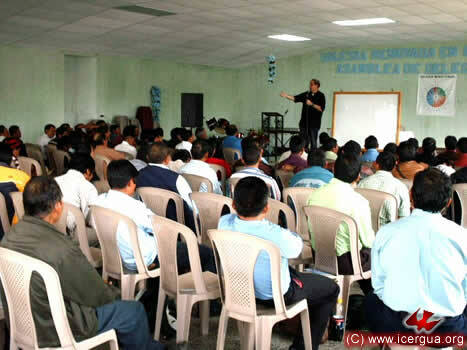 QUARTERLY ASSEMBLY IN CENTRAL HUEHUETENANGO. 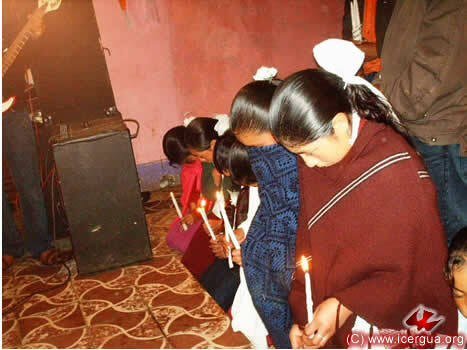 On the morning of August 21 the Quarterly Assembly came into session for the brothers and sisters of south and southwest Huehuetenango. In spite of the adverse weather condition, 150 faithful participated, coming from all the communities that meet in this Assembly. 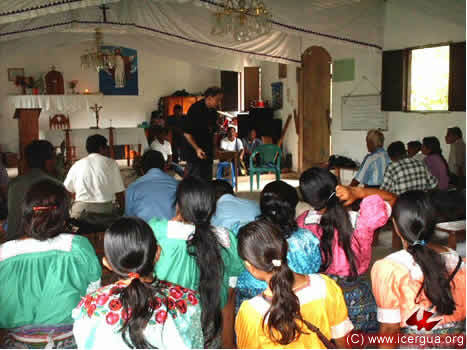 The incorporation of five communities of San Juan Antitán, Huehuetenango, into the Church had a prominent place in the meeting. 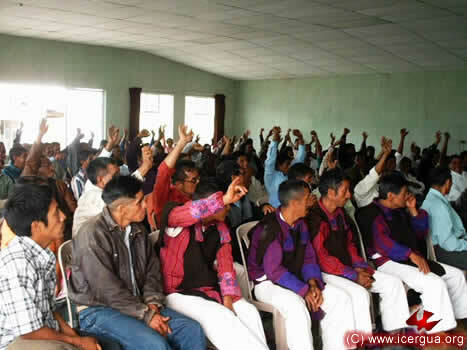 These communities have about 2000 members and are very enthusiastic about living the full charisma and identity of ICERGUA. After a representative from each of the zones made a presentation on the progress of its community, Monsignor Eduardo undertook the continuing education. As in the deanery meetings, the objective was to reach a better understanding of the development of the church and her organization, with the goal of being aware of the legitimacy of our mission and the distinctive traits that it ought to have. Left: The vote to approve some of the points that had been brought forward during the continuing education period. At the end of the Assembly the bishop presided at Eucharist for all who had participated. On the occasion, four new Communion Ministers were installed. 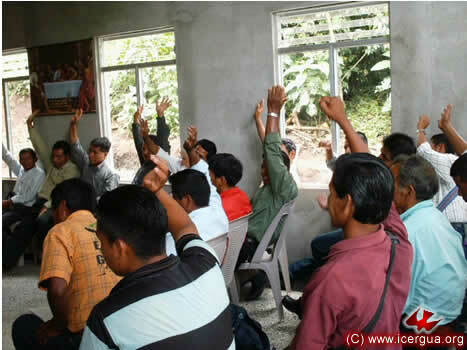 They will exercise their ministry in new communities that have recently made a covenant with ICERGUA. AUGUST 21. VISIT TO THE LA NUEVA ESPERANZA COMMUNITY, LA DEMOCRACIA , HUEHUETENANGO. On the afternoon of the twenty-first, the Monsignor presided at the Eucharist in the Nueva Esperanza Community, La Democracia. A delegation from the Pajales Community, San Antonio Huista, had also come. On the occasion, two couples’ marriages were celebrated. One of them was more than ninety years old. He had previously been given up as hopeless, and through the prayers of members of the community the Lord had granted him healing. 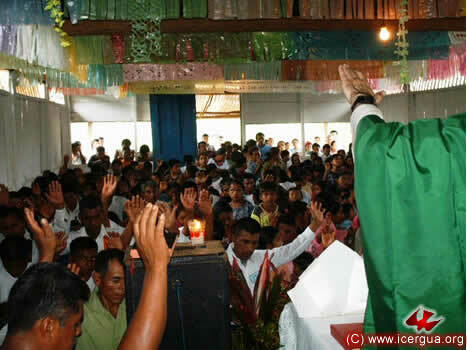 In face of this miracle, he was moved to join the church and regularize his life. In addition a large group of children made their First Communion and several baptisms were celebrated. Above: The bishop administering Absolution to those who had confessed. 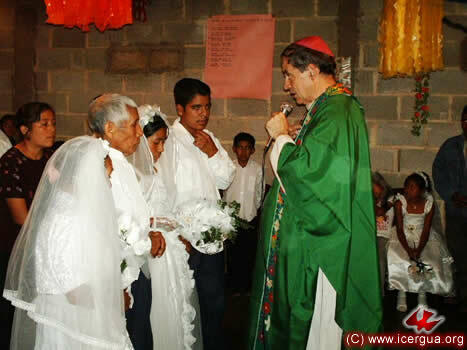 Right: Monsignor Eduardo asking the couples their intention to be married, upon which they gave their consent. AUGUST 22. 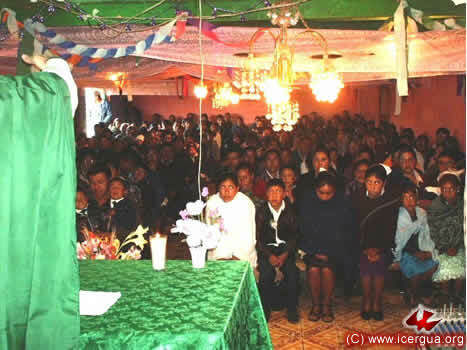 EUCHARIST IN SAN NICOLÁS, CHIANTLA, HUEHUETENANGO. 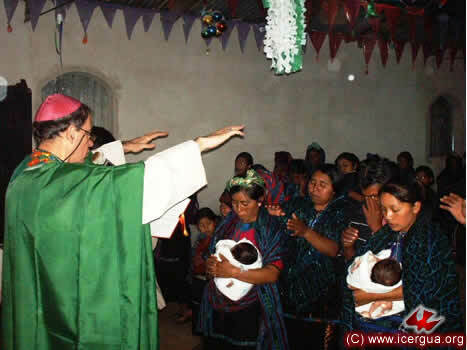 On Sunday the twenty-second, Monsignor Eduardo was in the San Nicolás Community, Chiantla, Huehuetenango. In addition to several baptisms, the confirmation of a large group of young men and women was celebrated. This community has finished building the walls of its new church. It will be fifteen meters wide and thirty meters long. Above: The People of God listing attentively during Monsignor Eduardo’s homily. Right: A group of the young people who had received Confirmation at prayer asking the Lord’s grace that they might persevere faithfully in the Confirmation commitments. AUGUST 26. DEANERY OF COBÁN, ALTA VERAPAZ. 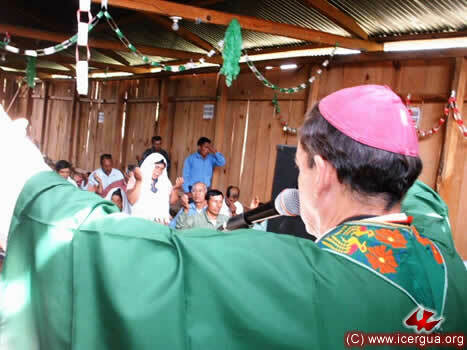 On Thursday, the twenty-sixth, the bishop’s quarterly visit to the communities in the north began: Alta Verapaz, Ixcán and Petén. It began with the Deanery of Cobán. 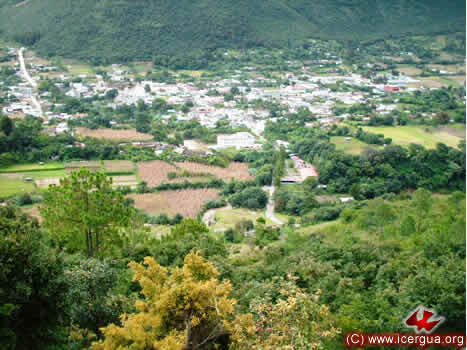 It comprises the communities of the municipalities of Cobán, San Pedro Carché, Lanquín and San Juan Chamelco. The faithful participated with enthusiasm, announcing the positive things happening in the communities and the considerable growth they are experiencing. Arriba: Vista del Centro Misionero de Tomtem, Cobán. 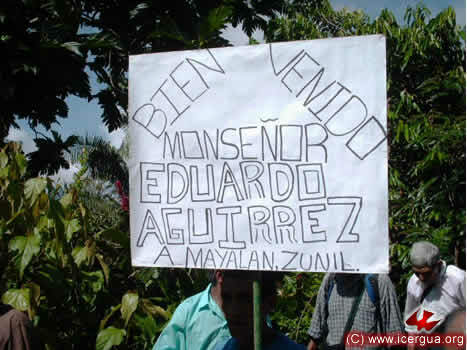 Aquí residen los Padres José Ángel Núñez y Fredy González, encargados de la acción pastoral en la zona de norte de Guatemala. Right: The bishop during the continuing education segment of the meeting. Left: The proposals having been made, those in attendance approving the various points that had been brought forward. AUGUST 26. 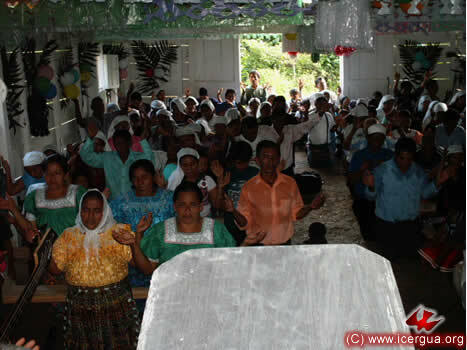 BLESSING THE SAPALAU CHURCH BUILDING, COBÁN, ALTA VERAPAZ. 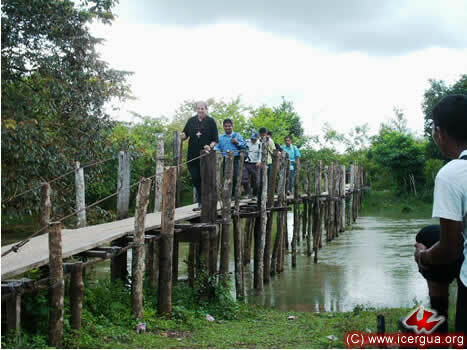 On the afternoon of August 26, the Monsignor went for the first time to the Sapalau, Cobán, Community. The reason for the visit was the blessing of the recently constructed church building. It was also a pastoral visit to this community, which joined ICERGUA only a few months ago and is experiencing robust growth and great gladness in its spiritual life. In order to get to Sapalau one takes the highway from Cubil to Playa Grande. At a certain point, it is necessary to leave the car and set off on a hike, crossing rivers, pastures and, at this time of year, marshes and morasses. Above: The committee accompanying the bishop crossing one of the rivers. Left: Prayer shortly after blessing the new church. At the visit, Brother Carlos, leader of the community, was installed as Communion Minister, for beginning with this visit the Most Holy Sacrament is remaining present in the new church. 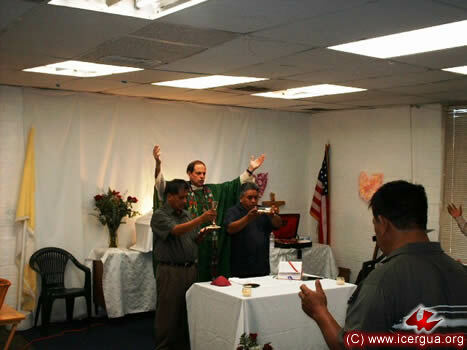 Right: Brother Carlos greeting the People of God at the end of the installation. AUGUST 26. 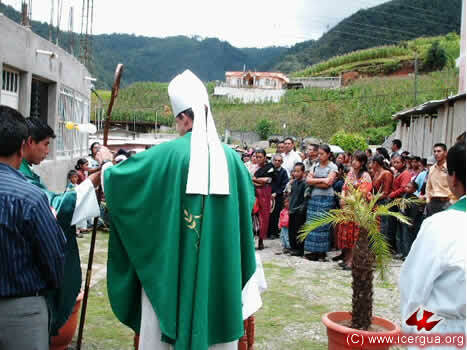 BLESSING OF THE SITE ON WHICH THE CAMCAL, COBÁN, CHURCH WILL BE BUILT. In the evening, under pouring rain and after climbing a mountain, between mud and slides, the bishop presided at Eucharist with the participation of 300 faithful. The had gathered there in order to bless the property, recently acquired, where the new house of prayer will be built. The faith and enthusiasm of the People of God made the great difficulty of getting there very worthwhile. Left: The bishop distributing communion to the participants in the celebration. AUGUST 27. DEANERY OF PETÉN – CHISEC – RAXUJÁ IN CRUCE DEL PATO. 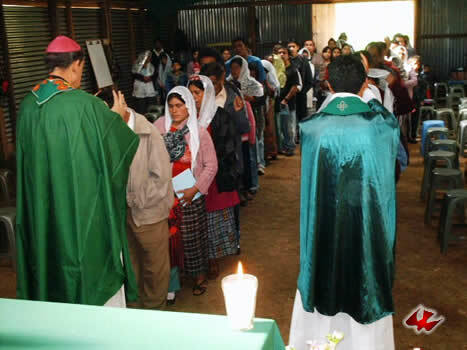 On the morning of August 27 and lasting more than four hours, the Deanery of Petén was held with representatives also from the parishes of Chisec and Raxujá-Fray Bartolomé de las Casas. The growth of each community was noted, as well as the addition of new communities in each of the areas. In addition several pastoral standards were elaborated that should be followed in order to face the pastoral challenges that come up. Also, several resolutions were approved. Above: The bishop reporting on the progress of the church in the other regions. Left: One of the brothers expressing his points of view before the decision was made on the various proposals that had been made. Right: One of the votes taken before the Deanery closed. AUGUST 27. BLESSING OF THE HOUSE OF PRAYER OF EL ERIAL DEL PILAR, FRAY BARTOLOMÉ DE LAS CASAS. 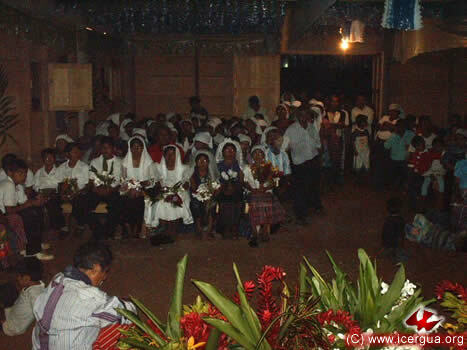 On the afternoon of August 27, Monsignor Eduardo, after crossing the La Pasión River by boat, came to the Erial del Pilar Community, which with the other two communities in Fray Bartolomé de las Casas were making a covenant with ICERGUA, entering into the San Fernando Parish in Sayajché, Petén. The bishop blessed its recently built house of prayer. 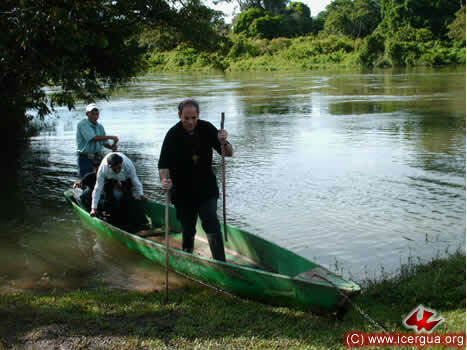 Above: The bishop getting out of the boat that he used to cross the La Pasión River. Right: The entrance procession for the celebration of the Eucharist going from the house of one of the faithful to the recently built house of prayer. 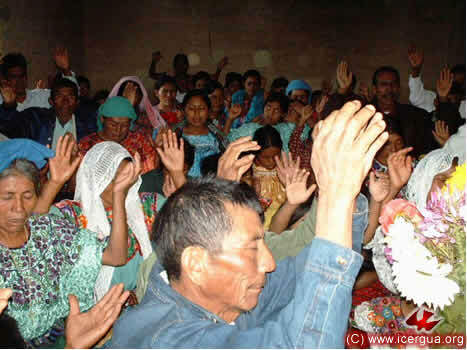 Left: The faithful in deep prayer, having confessed their sins, now praying for the outpouring of the Holy Spirit to attain forgiveness. AUGUST 27. VISIT TO THE YALICOC, RAXUJÁ, COMMUNITY, ALTA VERAPAZ. 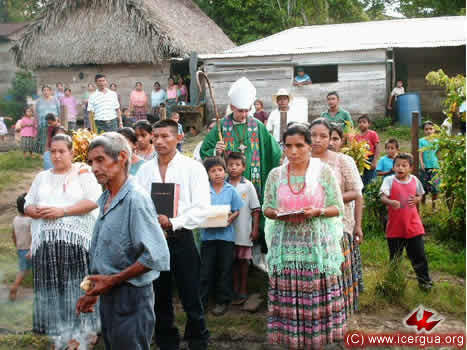 On the evening of the August 27 the bishop visited the Yalicoc Community, where the parish that will serve the municipalities of Raxujá and Fray Bartolomé de las Casas will have its center. This community made its ICERGUA covenant five years ago. At present it is busy with building a beautiful and good-sized church. Several baptisms were celebrated, and a couple was married. 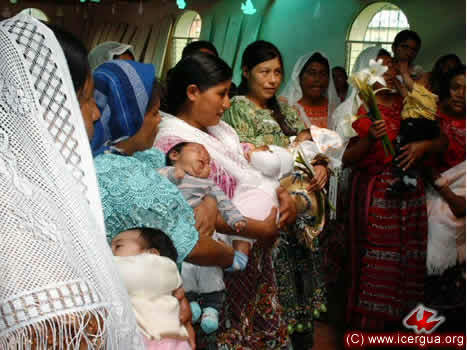 Left: One of the celebrations of baptism. 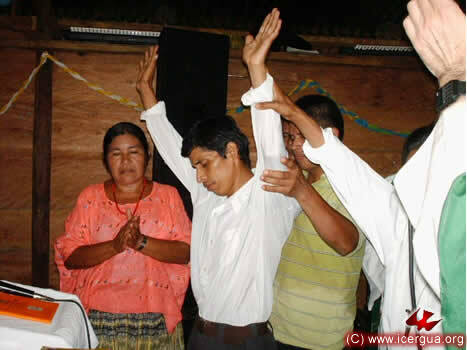 Right: After the marriage ceremony, the sponsors prayer over the newly weds. One of them was brother Santiago Rax, grandfather of several Seminarians. He was widowed some time ago and now he is marrying a woman who also had been widowed. AUGUST 28. DEANERY OF IXCÁN IN PUEBLO NUEVO, IXCÁN, EL QUICHÉ. 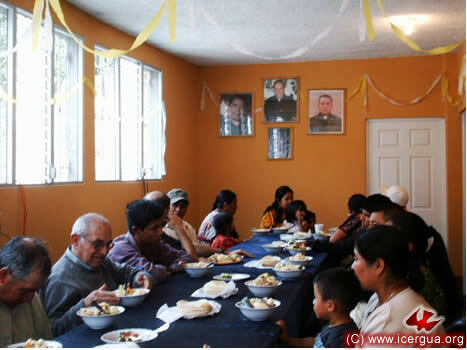 On the morning of August 28, after several unexpected delays because of the rain and badly damaged roads, Monsignor Eduardo arrived at Pueblo Nuevo, Ixcán, for the Deanery. Many delegates were there, representing all the communities. 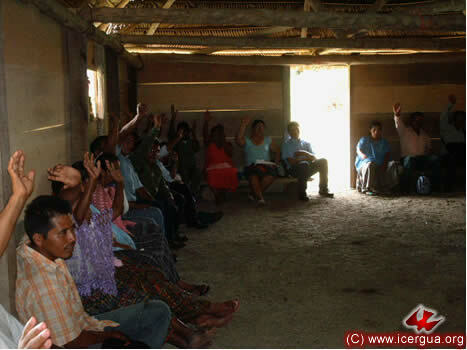 One of the questions that was taken up was the difficulties through which the Santiago Ixcán Community is going. In face of the differences that divide them, it was decided to draw upon the wait-and-see strategy of Gamaliel (Acts 5:34): to encourage the faithful to work together in spite of their differences so that in due time the Lord may give signs that will make a deeper discernment possible. In this way they are open to a discernment that may make it possible for liberty to be harmonized with unity. Above: The bishop listening to the presentations that the representatives of the various communities are making. Right: The bishop during the continuing education. AUGUST 28. 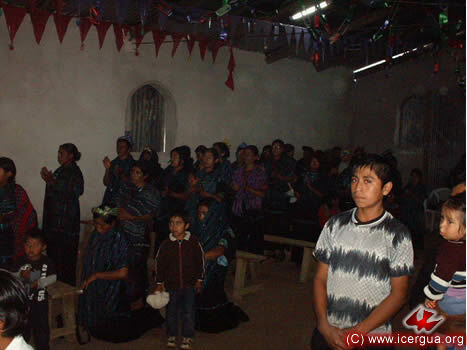 BLESSING OF THE HOUSE OF PRAYER IN ZUNIL, IXCÁN, EL QUICHÉ. 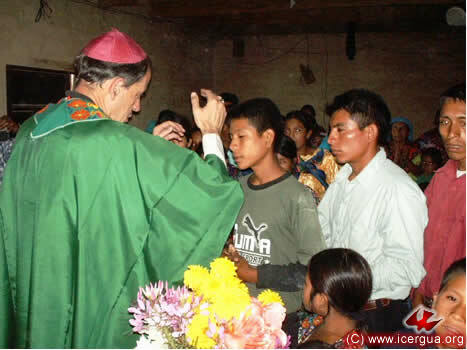 In the afternoon, the bishop’s first visit was to the Zunil Community, located very near the Ixcán River, which separates the departments of Huehuetenango and El Quiché. The reasons for the visit was to bless the house of prayer and to have a first direct contact with the members of the community. Above: In spite of the inclement weather, the faithful decided to go out and receive the bishop with placards and other festive signs. In the photograph, one of the welcoming posters. Right: Prayer before beginning the celebration of Eucharist. One can see how numerous are the faithful who comprise part of the community. AUGUST 28. 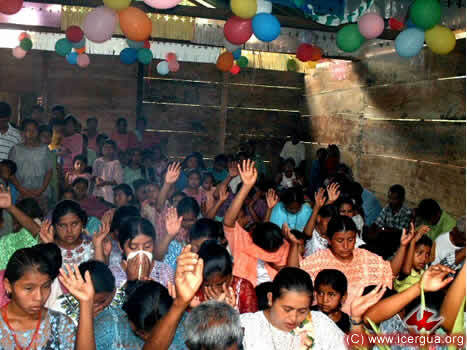 BLESSING OF THE HOUSE OF PRAYER IN MAYALÁN, IXCÁN, EL QUICHÉ. 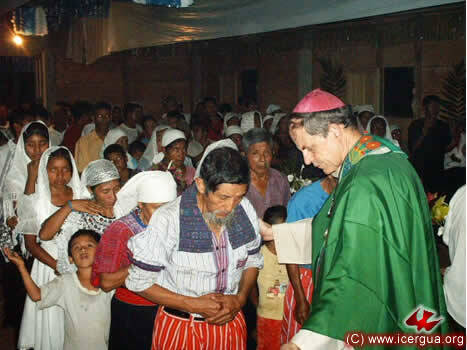 In the evening the bishop made his first pastoral visit to the Mayalán Community, very close to that of Zunil. The community consists primarily of people who belong to the Mam ethnic group. Begun only recently, this community has succeeded in building a large and beautiful church, which was blessed during the bishop’s visit. The Most Holy Sacrament that used to be in a temporary chapel was solemnly moved to the new church. A large group of the faithful received the sacrament of Confirmation. Right: The Eucharist. In the front row, some of the faithful who received Confirmation. AUGUST 29. COVENANT AND FIRST VISIT TO THE COMMUNITY OF SEPOC II, CHISEC, ALTA VERAPAZ. On Sunday, August 29, Monsignor Eduardo made his first pastoral visit to the Sepoc II Community in the municipality of Chisec, Alta Verapaz. It has more than 300 members and is very encouraged about continuing to grow in faith and in proclaiming the Good News. On the occasion of the visit, a large and well prepared group of young people received the sacrament of Confirmation. At right: the young people at prayer after being confirmed. AUGUST 31. 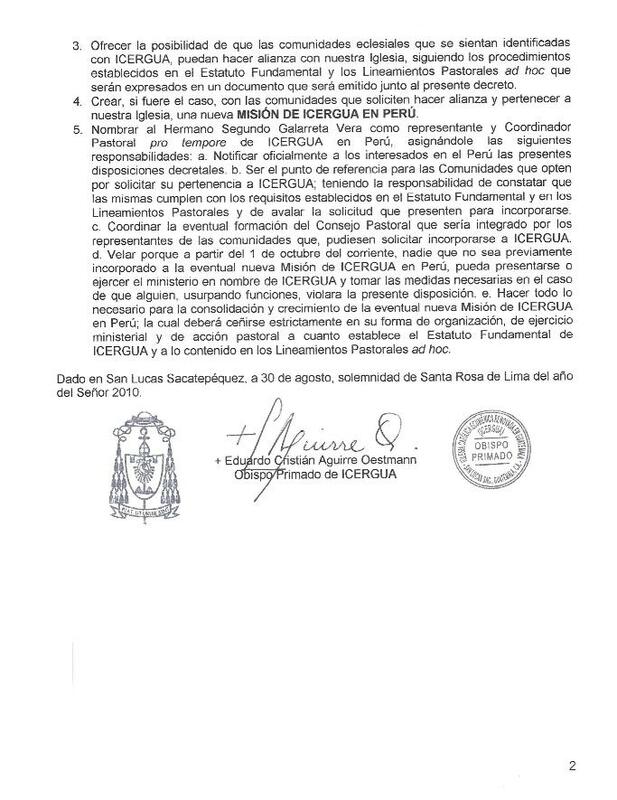 REVOCATION OF DECREES AND THE CREATION OF THE NEW MISSION, ICERGUA-PERU. 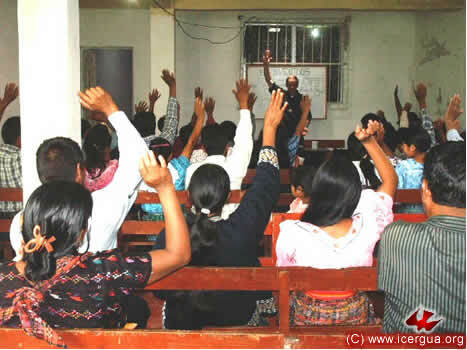 In September, 2008, ICERGUA created a mission in Peru, in response to the request of some presbyters there. 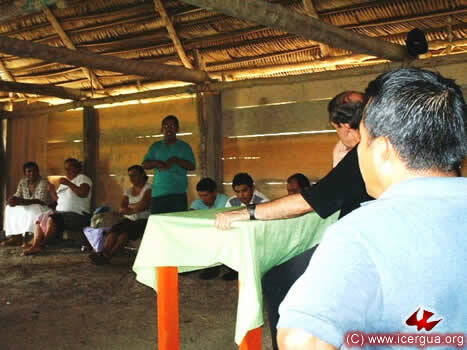 That the mission began with the presbyters was a departure from the Constitution of ICERGUA, which prescribes that the entities that make a covenant with us and who become part of our Church are communities. 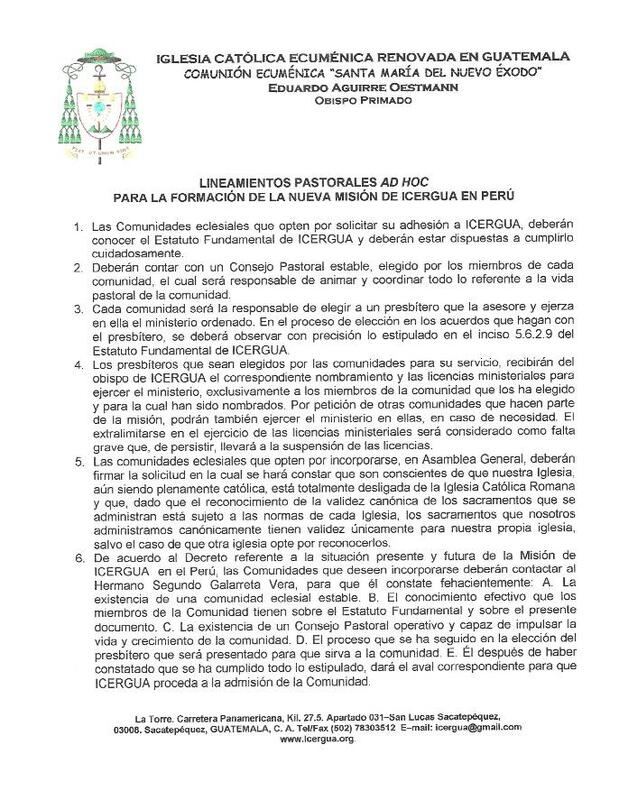 Furthermore, the Fundamental Constitution prescribes that the secular presbyters, which is the case in Peru, receive ministerial licenses and appointment in ICERGUA only at the request of the communities that have elected them to exercise the ministry for their sacramental edification. After two years of this irregular situation, deviating from our Constitution, and in face of the rise of several communication problems and difficulties arising from an exercise of ministry that does not conform to ICERGUA standards, the conclusion has been reached that it was time to begin the mission anew, following the procedure envisioned in our Constitution. 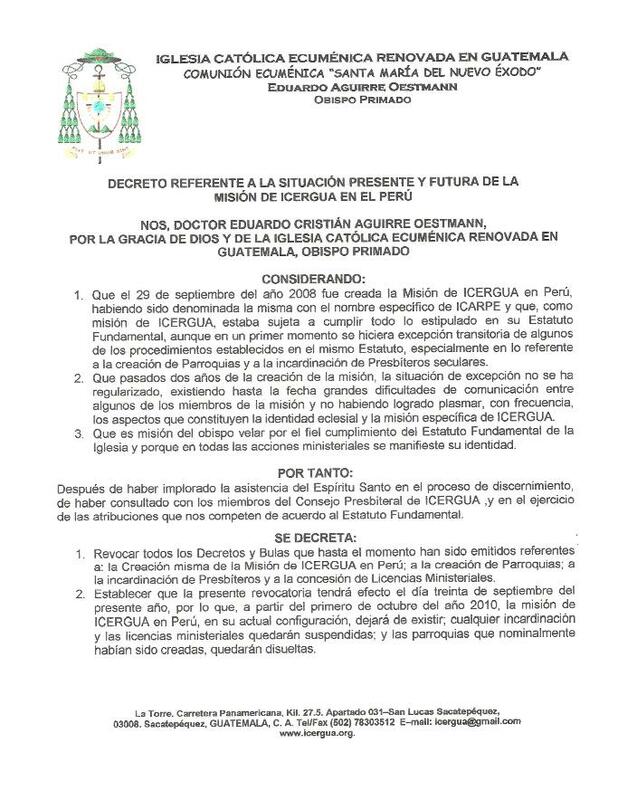 That implies that, beginning September 30, 2010, the mission in its present form be dissolved, that the entities called parishes also be dissolved and that all the presbyterial installations that have been made and ministerial licenses awarded be revoked. 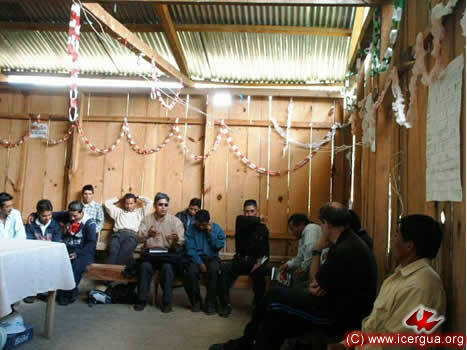 At that time, the communities that identify themselves with the identity and mission of ICERGUA and that are in a stable condition will be able, if they wish, to request incorporation into ICERGUA, and, if there be such, a new mission of ICERGUA in Peru will be created. Only those presbyters will receive ministerial licenses who are elected by the communities that wish to join our church, and the licenses will be granted only for the celebration and administration of the sacraments in the communities that elected them. In this way, we want to assure that if there be an ICERGUA mission in Peru in the future, it may truly reflect our identity and mission, and oblige itself to fulfill the terms and procedures of our Constitution. 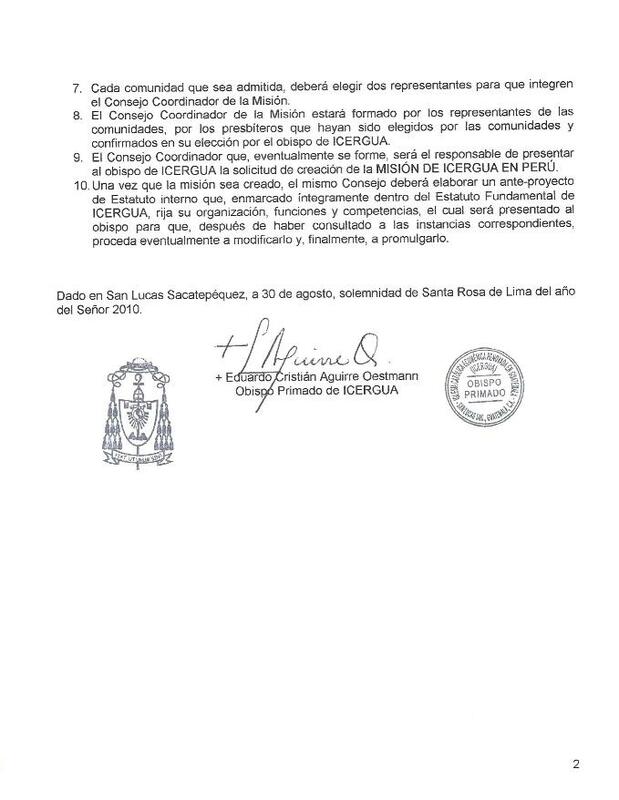 We also want to assure that the presbyters that attend to them pastorally and sacramentally not participate in any way in sacramentalism, sacramental mercantilism, usurpation of functions and that they not mislead the faithful of other churches.